A Monster Calls is now in paperback! I never got to meet Siobhan Dowd. I only know her the way that most of you will - through her superb books. Four electric young adult novels, two published in her lifetime, two after her too-early death. If you haven't read them, remedy that oversight immediately. This would have been her fifth book. She had the characters, a premise, and a beginning. What she didn't have, unfortunately, was time. Ness goes on to say that he felt trying to write a book mimicking Dowd's voice would have been a "disservice to her, to the reader, and most importantly to the story... But the thing about good ideas is that they grow other ideas... I felt- and feel - as if I've been handed a baton, like a particularly fine writer has given me her story and said, 'Go. Run with it. Make trouble. So that's what I tried to do." Ness has grown Dowd's ideas and followed his only guideline, to write a book he thinks she would have liked. He ends his note by saying, "And now it's tie to hand the baton on to you. Stories don't end with the writers, however many started the race. Here's what Siobhan and I came up with. So go. Run with it. Make trouble." 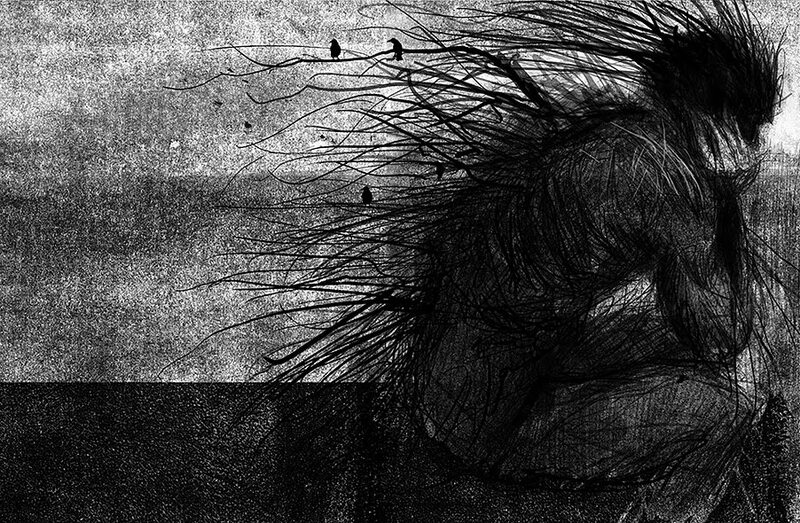 A Monster Calls is a story of what happens when you push the truth away. And the truth of this story is a very hard one to accept and to ignore. Conor O'Malley is a thirteen year old boy living alone with his mother who is dying of cancer. She won't admit this to him, though, always insisting that the latest treatment she is undergoing will work best. His father remarried years ago and has a new family in America. Conor's grandmother, a brusque, brisk woman who is not big on words, swoops into the take over the care of his mother, something Conor had been doing just fine on his own, thank you. Lily, once Conor's close, longtime friend, has made his life miserable by telling the whole school his mother is dying of cancer and he can't bear to be around her anymore. Harry, the school bully, is diabolically, mercilessly brutalizing Conor who seems to take it willingly, refusing to tell on him even in the safest of situations. Then things get worse. A monster calls. At 12:07 am the yew tree from the churchyard behind Conor's house roars to life in the form of a giant tree-man and punches his way into Conor's room, bellowing "I have come to get you, Conor O'Malley." Conor is nonplussed. Assuring him that, by the end of their time together he will be scared, the monster says, "Here is what will happen Conor O'Malley. I will come to you again on further nights. And I will tell you stories. The tales from when I walked before." This leaves Conor even less scared than before, but the monster assures him that, "Stories are the wildest things of all. Stories chase and bite and hunt... And when I have finished my three stories you will tell me a fourth." The yew tree-man of A Monster Calls is right. Stories can chase and bite and hunt. As a numb Conor continues to alienate himself by refusing the reality that is in front of him, despite efforts of his grandmother, father, teacher and school bullies, the monster's stories chase and bite and hunt him down, as does a nightmare that has followed Conor ever since his mother "had first been hospitalized, from before that when she'd started the treatments that made her lose her hair, from before that when she'd had the flu that didn't go away until she went to a doctor and it wasn't the flu at all, from before even that when she'd started to complain about how tired she was feeling." By the climax of A Monster Calls when Conor is forced to tell his story, his own truth, he confronts his nightmare and the meaning behind it. However, he could not have reached that point, the ability to tell his own story, to confront his own truth, without the stories and the power of the monster behind him. As he sadly, slowly realized near the end of the book, the yew-tree-man monster has come to heal him, not his mother. The monster is a brilliant creation - part giant, part yew tree, destructive, didactic, elemental. It tells Conor three stories, which work, like New Testament parables, by wrongfooting you. The good guys turn out to be bad and the bad guys good. Elegantly, the same goes for the overarching story, in which the nightmare monster is less frightening than daylight family. The prospect of Conor's mother's death brings not only grief and the primal fear of death itself but also a list of no less terrifying pragmatic anxieties: who is going to look after me? Who can I count on? Where will I live? The stories that the monster tells, although brief, are also gripping in and of themselves, another wonder of this book. Set in the distant past, they have a fairy-tale feel and a breathless pace. At the end of the first story, as Conor is trying to figure out who was good, who was bad and who deserved to be punished, he complains loudly to the monster about the cheating nature of the story. The monster responds, "It's a true story. Many things that are true feel like a cheat." Again and again Ness finds ways to simply state the truth of existence, the pain of uncertainty and the grief and guilt come when another's suffering is both unavoidable and unbearable, all the while making it bearable, digestible, by wrapping these truths in metaphors that make the story. I have to admit, as much as I read A Monster Calls with a sense of both dread and parental tenderness for Conor, I wondered to myself often, "Who would give this book to a kid? What kind of kid would grab it off the shelf and choose to read it?" Of course, one of the most wonderful things about having an emerging reading life is the pleasure of wandering the aisles of a library or bookstore and choosing a book on your own. 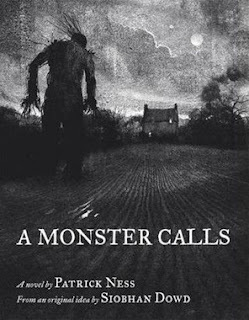 I have no doubt that the cover and title of A Monster Calls would surely grab the attention of many readers who, as they delved deeper into the book, might be surprised by the true nature of the terror that Conor is facing. And that, too, is one of the pleasures of having a reading life - finding a book that appears to be one thing and turns out to be another. And I am sure that readers who experience this book in this fashion will recall it for a lifetime, the images and characters are so intensely vivid. As an adult, I have lost my father to cancer and held the hand of my grandmother as she died. While I would never wish a child to have to experience such loss and grief, the reality is that children do, often. And, as I said about Liz Kessler's A Year Without Autumn, this is a book for children who are reaching the age when their senses of empathy kick in and they become interested in the difficulties and suffering of others (as a bookseller, I have also noticed that this is the same time - middle school age - when kids begin to develop an interest in the Holocaust). Empathy is both innate and learned and I would not hesitate to give A Monster Calls to a young reader for that very reason. Without giving too much of the climax away, A Monster Calls teaches empathy both for others, but mostly for oneself. Siobhan Dowd's other book for middle-grade readers is the phenomenal mystery that I reviewed in June of 2009, The London Eye Mystery. Please consider reading even just the first few paragraphs of this review to learn more about Siobhan Dowd and what an amazing person she was.